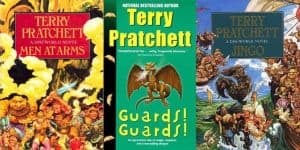 New Discworld TV Series Coming From BBC Studios | Nerd Much? A few weeks ago, I lamented the lack of a recent adaptation of Sir Terry Pratchett’s Discworld books. Then, I made some phone calls to a few contacts and made it happen. Not really — but it is happening, and it has the potential to be something magical. Discworld is a 41-book fantasy-satire series that has made the late Terry Pratchett an internationally best-selling author. Discworld itself is a massive disc that sits on the backs of four elephants standing on top of the cosmic turtle A’Tuin. There are several different character arcs, and many entries in the series have crossover characters and references to other arcs. It’s a worldbuilder’s dream — each book builds on the last, and Discworld is complex and in constant flux. This series is silly, dark, hopeful, human, and fun. This singular sense of humor is being adapted in a six-episode series by BBC Studios, with the hopes of creating a returnable franchise, according to Deadline. Narrativa, Terry Pratchett’s production company, will co-produce with BBC Studios. Simon Allen (Spotless, Strike Back) will be writing the series. With a working title of The Watch, the series will focus on the City Watch arc, which includes classic Discworld novels like Guards! Guards! and Men at Arms. These novels follow Sam Vimes, the head of the city watch of Ankh-Morpork, and are mystery-inspired urban adventures in Discworld’s most beloved, bustling, filthy city. The possibility for a returning series is promising. There are eight City Watch novels to draw from, which will provide plenty of material and colorful characters. It’s unclear yet whether The Watch will focus on one novel at a time or will simply draw from its characters and setting. Either way could work well as a miniseries, and if The Watch is successful, we might be lucky enough to see some more Discworld adaptations developed alongside this one. After all, there’s an entire world to explore.